WCCLS Mobile allows you to do many of the things you do on the regular WCCLS website, but on a site optimized for a mobile device like a smartphone or tablet. You can search the catalog, place holds, check your account, look up library hours and locations, and browse new and popular titles. 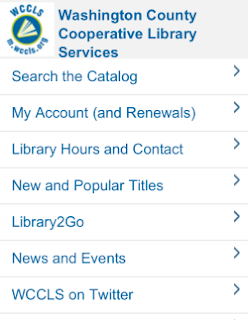 If you visit the full version of the WCCLS catalog on a mobile device, you may be automatically redirected to the mobile version. You'll find a link to the full version of the catalog on the mobile site, and vice versa. WCCLS Mobile is not an app - you don't need to download anything to your smartphone or tablet. Simply visit m.wccls.org using the internet browser on your device. You may want to bookmark or save the site to your home screen for easy access. If you have any questions about using WCCLS Mobile, visit our information page to learn more. We're happy to be able to bring you a mobile-friendly version of WCCLS online, and we hope that you find it convenient to be able to tap into your library, wherever you are.